Photograph depicts the Giscome Rapids. Opposite shore in background, rocky beach in foreground. Handwritten photo caption on verso and recto of this photo reads: "Point where G.T.P. 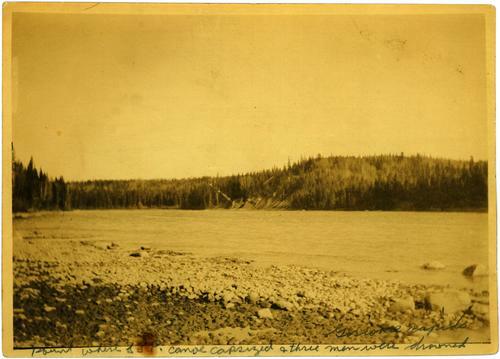 [Grand Trunk Pacific] canoe capsized at Giscome Rapids & where 3 men were drowned." Item is part of the Taylor-Baxter Family Photograph Collection. Item is one of 31 photographs portraying Bourchier's supply freight transport business, see also items 2009.5.3.1 - 2009.5.3.31.